Preview Final Day: Exciting finale awaits, who will prevail on closing day in Daejeon? Three days of table tennis magic down, one to go. 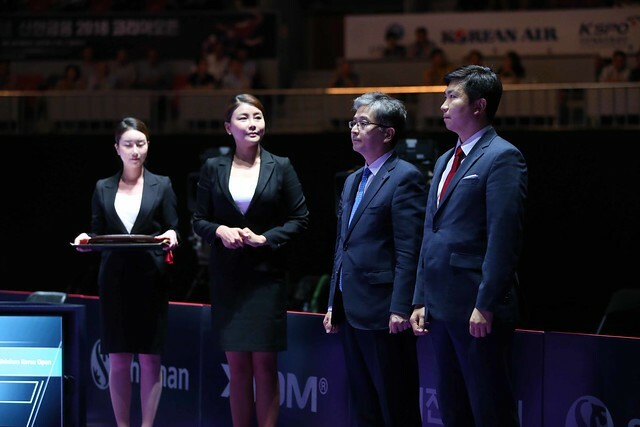 The final day of the Seamaster 2018 ITTF World Tour Platinum Shinhan Korea Open features an exciting programme you won't want to miss with the doubles and singles tournaments both officially drawing to a close on Sunday 22nd July. Who will leave Daejeon with silverware to their names? Take a look at what's coming your way on the final day at the Daejeon Hanbat Stadium. The first final of the day comes from the Women’s Doubles tournament as two Chinese partnerships battle it out for glory at 3.00pm (local time). On paper the slight advantage should lie with No.3 seeds Wang Manyu and Zhu Yuling, who enter the tie seeded one position above their opponents but we all know that matches aren’t decided on paper – be sure not to miss what’s expected to be a thrilling start to the day’s action. Korea Republic’s first gold medal opportunity of the day comes soon after with the Men’s Doubles final being the second item on the schedule. With the backing of the home crowd the pairing of Jang Woojin and Lim Jonghoon will be hoping to pull off a fairy-tale ending to the campaign but to do so they must stop top seeds Ho Kwan Kit and Wong Chun Ting. Following the conclusion of the doubles finals there are two more contests to be resolved starting with the finale to the Women’s Singles draw. Battling it out for the 16th time on the international stage and meeting in a final for the ninth occasion Chen Meng and Zhu Yuling are well accustomed to each other’s game and are bound to play out a spectacular encounter in Daejeon. Zhu Yuling leads the head-to-head 8:7, but will top seed Chen Meng bring parity to the record? Jang Woojin will then step up for his second final of the day with the host nation star taking on China’s Liang Jingkun for the Men’s Singles crown in the final fixture of the Korea Open. Both required to compete in the qualification tournament, Jang Woojin and Liang Jingkun have performed exceptionally well to reach the final in Daejeon but only one can emerge at the summit of the podium. Jang Woojin is searching for his second Men’s Singles gold on the ITTF World Tour while Liang Jingkun is aiming to pick up his first.